Produced by the centenary distillery Unidas S.A., Venezuela, Diplomatico Reserva Exclusiva rum is an exceptional blend handcrafted in the distillers' tradition, reaching unparalled complexity thanks to the impressive rum stocks of the company and masterful blending skills. 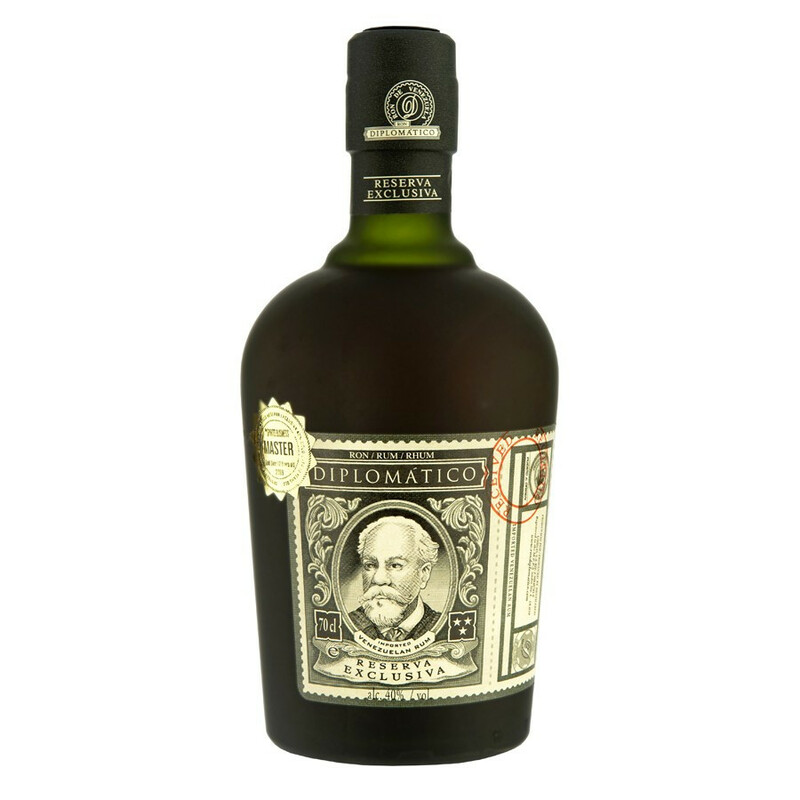 During year 2007 only, the Diplomatico range has received not less than 16 gold medal at International Competitions of San Francisco, Florida, London, New Orleans and Brussels! Diplomatico Reserva Exclusiva is a blend of woody aromas, dried fruits and honey. It has been traditionally aged in oak casks. At the end of the 19th century, in Venezuela, Don Juancho Nieto Meléndez discovered a passion for sources and methods making the success of traditional beverages. He was fascinated by the subtle complexities of surrounding factors such as sunlight and humidity that affect the production of rum. He collected both liqueurs and exotic rums and became famous for his well-stocked supplies quickly nicknamed the "Ambassador Reserves" in reference to his status and his love for good things in life. He studied production methods used in Jamaica, a reference in the field at the time. On other islands of the Antilles, he scrupulously observed the refining of sugar cane and imagined variations to create a new type of rum. Over time, a clever combination of ingredients, wooden barrels and honey led Don Juancho to create Ron Diplomático. Mellow. Fruity. Caramelised. Honeyed. Woody (sandalwood, old leather, havana cigar). Spicy (black pepper, ginger). Colour: amber colour with copper reflects. Nose: sweet nose, growing strong when allowed to breathe. Dominated by stewed fruits and remarkably well meld blond tobacco and honey. Palate: mellow at first, even syrupy. Develops amazing aromatic richness when coating the mouth. Wonderfully varied intense flavours: dried fruits, stewed fruits, butter caramel, acacia honey, havana cigar, tanned leather, sandalwood. Perfectly meld and balanced. Finish: quite syrupy, lifted with a hint of spices (black pepper, ginger) for a lasting finale to be enjoyed thoroughly. Tito Cordero, Master Blender of Diplomatico Rum, has been recognised as Master Blender of the Year 2013. Rum Diplomatico producers picked the UK Rumfest "distillery of the Year 2013" award. 2009 - Gold Medal, Ministry of Rum Tasting Competition. 2008 - Gold Medal, International Competition Bruxelles.